Are you, or someone you know, interested in learning about the latest developments happening right now in Fracture Mechanics? Would you like the chance to meet a wide range of experts from across the industry? Do you want to know more about the uses and capabilities of Crack Growth Analysis tools? All of these opportunities and more are available to you at the AFGROW Users Workshop. The purpose of the Workshop is to provide a forum for AFGROW Users to come together to exchange information and best-practices, network with peers from the industry, and get a chance to talk with the AFGROW developers and community. Group discussions will also provide direction for new capabilities and improvements, best practice methods, and tips and tricks from the experts. The AFGROW team will also provide information on our latest development efforts for the upcoming year. The only quantifiable measure of sub-critical damage is a crack. Cracks impair the load-carrying characteristics of a structure. As described above, a crack can be characterized for length and configuration using a structural parameter termed the stress intensity factor (K). This structural parameter was shown to interrelate the local stresses in the region of the crack with crack geometry, structural geometry, and level of load on the structure. In a manner similar to Irwin, who utilized the stress intensity factor for fracture studies, Paris and his colleagues at Lehigh University and at the Boeing Company developed a crack mechanics approach to solve sub-critical crack growth problems [Paris, et al., 1961; Donaldson & Anderson, 1961; Paris, 1964]. That is, a material’s rate of crack growth is a function of the stress intensity factor. The stress intensity factor is shown to explicitly depend on time in order to indicate the influence of its waveform on the crack growth rate. The value of the hypothesis stated by Equation 2.2.6 is that the material behavior can be characterized in the laboratory and then utilized to solve structural cracking problems when the structure’s loading conditions match the laboratory loading conditions. A general description of the procedure utilized will be presented in Section 2.5. Section 5 is devoted to a complete description of the detailed methodology available to a designer for estimating the crack growth life of a structural component using a material’s crack growth rate properties. A verification of Paris’ Hypothesis was first conducted using fatigue crack growth data generated under constant amplitude type repeated loading. The parameters that pertain to constant amplitude type loading are presented in Figure 2.2.6. Figure 2.2.6a describes a repeating constant amplitude cycle with a maximum stress of smax, a minimum stress of smin, and a stress range of Ds. The stress ratio (R) is given by the ratio of the minimum stress to the maximum stress. In describing constant amplitude stress histories, it is only necessary to define two of the above four parameters; typically Ds and R or smax and R are used. A stress history is converted into a stress-intensity factor history by multiplying the stresses by the stress-intensity-factor coefficient (K/s). As can be noted from the figure, the coefficient is evaluated at the current crack length ai and the stress-intensity-factor history is shown to be a repeating cyclic history in Figure 2.2.6b. The terms Kmax, Kmin and DK define the maximum, the minimum and range of stress-intensity factor, respectively. Strictly speaking, the stress-intensity factor history given in Figure 2.2.6b should not be shown constant but reflective of the changes in the stress-intensity-factor coefficient as the crack grows. For small changes in crack length, however, the stress-intensity factor coefficient does not change much, so the portrayal in Figure 2.2.6b is reasonably accurate for the number of cycles shown. 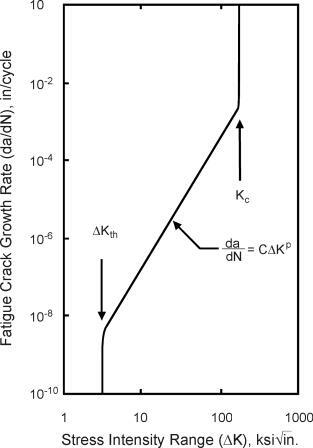 The fatigue crack growth rate behaviors exhibited by a plate structure subjected to two extreme loading conditions (but at the same nominal stress level) are compared in Figure 2.2.7 [Donaldson & Anderson, 1961; Anderson & James, 1970]. These loading conditions are referred to as wedge loading and remote loading. In the remote loaded structure, the rate of crack length change accelerates as the crack grows. An opposite growth rate behavior is exhibited by the wedge loaded structure. These two extreme loading conditions provide a good test for the application of the fracture mechanics approach to the study of fatigue crack growth rates. If the approach can be used to describe these opposite growth rate behaviors, then it should be generally applicable to any other type of structure or loading. Paris, et al. , suggested that the appropriate stress intensity parameter for fatigue crack propagation should be the difference between the maximum and minimum stress-intensity factors in a cycle of fatigue loading. This difference in the stress-intensity factors is the stress intensity range (DK) and it measures the alternating intensity of the crack tip stress field responsible for inducing reversed plastic deformation. The stress-intensity range as a function of crack length is obtained from the static stress-intensity-factor formulas where the range in stress (load) replaces the static stress (load). Section 2.5 provides a more extensive description of the calculation procedures for stress-intensity-factor parameters that are used to describe sub-critical crack growth. Approximate expressions for the small crack in a wide plate are shown in Figure 2.2.7. The reader will note that the stress-intensity factor for the remotely loaded wide plate increases with crack length while just the reverse is observed to occur for the wedge loaded wide plate. Drawing tangents to the cyclic crack length curves given in Figure 2.2.7 provides estimates of the cyclic (fatigue) crack growth rates at various crack lengths (da/dN @ Da/DN ). Calculation of corresponding stress-intensity ranges for these same crack lengths provides the data plotted in Figure 2.2.8 [Donaldson & Anderson, 1961; Anderson & James, 1970]. 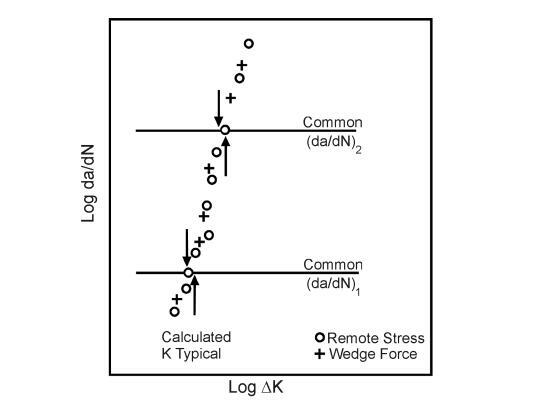 Note that at the same stress-intensity range (DK), the same crack growth rate (da/dN) is observed, even though both the form of the stress-intensity equations and the cycle-crack length curves are very different. where C and p are experimentally developed constants. Fatigue crack propagation data of the type shown in Figure 2.2.9 can be conveniently collected using the conventional specimen geometries where load is controlled and the crack length is measured optically (20x) as a function of applied cycles. The details of the methodology employed to generate such curves are covered in Section 7. The application of sub-critical crack growth curves to the design of a potentially cracked structure only requires that the differentiation process be reversed. In other words, given crack growth rate data of the type shown in Figure 2.2.9, the designer integrates the crack growth rate as a function of the stress-intensity factor for the structure through the crack growth interval of interest. Other investigations have demonstrated that sub-critical crack growth processes that result from variable amplitude loading, stress corrosion cracking, hydrogen embrittlement and liquid metal embrittlement can in general be described using Equation 2.2.6. The sub-critical cracking of structural materials has been successfully modeled with fracture mechanics tools primarily because the plastic deformation processes accompanying cracks are localized and thereby controlled by the surrounding stress field. As suspected, the magnitude in the elastic crack tip stress field is found to correlate well with the rate of sub-critical crack advance.